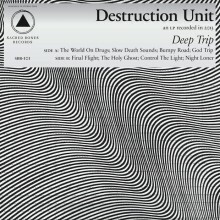 If Destruction Unit’s Deep Trip were a picture, it would be a cartoon fight, the classic dust-up where a large swirl emerges and the only visible parts of the combatants are the fists and boots sticking out of the mini tornado. Destruction Unit prefer to think of their album Deep Trip as a spiritual experience, or an awakening. 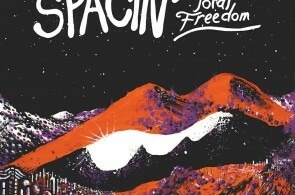 The liner notes are written as if the album is a pill, one whose intent is to bring a sense of nirvana upon the user, but one which may also include serious side effects like “confusion, frightful visions, and images, fear of dying or losing control, feeling controlled by and unable to escape from the definitions one has grown accustomed to or being overwhelmed by the immensity of life.” And here I thought the goal of Destruction Unit was to make a racket and break stuff. Whether Deep Trip is a manic collection of psychedelic rock and punk rock meant to be felt on an instinctive level or something more spiritual in nature, the immediate effects of tracks like lead number, “World on Drugs” cannot be denied. Its five minutes include lots of gnarly feedback, selections of ’80s SoCal thrash, and other slower movements which come off as mystical in a Jim Morrison as poet and prophet kind of way. You will feel something. Deep Trip is relentless. The gnarly feedback of “World On Drugs” bleeds into “Slow Death Sounds,” and neither the tempo nor the noise are turned down one bit. At this point it’s fair to ask if feedback should be considered an instrument in of itself and not a sound from an instrument. “Bumpy Road,” addresses the main weakness of the band coming off of Void, their first 2013 release. Before, when they weren’t maniacally thrashing they came off as nothing more than neighborhood pot heads thrilled by the sound of themselves making music and the fact that they can hold the attention of the pot heads in the room who didn’t bring any instruments, but brought Doritos instead. They were aimless. Here, they may wander and waver and let guitar melodies hang like smoke rings in a carefully sealed room, but those same melodies also align themselves into thumping, proto-metal grooves. Your drop-out uncle still stuck in a bitchin’ Camaro state of mind would approve. Still, for a band with such a wicked mix (thrash, screech and doom can’t lose), Destruction Unit have yet to tap their full potential. The second side of the album is more of the same. You won’t be nineteen minutes closer to selflessness. You won’t be one with the light. You won’t break more things. You’ll be totally knackered out from all the destruction you did during the A-side and ready for a nap.